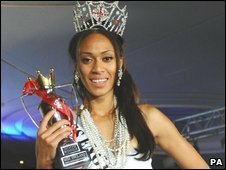 Linford Christie's niece, who hopes to compete in London's 2012 Olympics, has become the first black Miss England in the competition's history. Rachel Christie, 20, from West Kensington, west London, won the crown after a public vote on Monday night. The heptathlon specialist will now compete for the Miss World title in South Africa later this year. Kat Hodge, a 21-year-old soldier from Kent, decorated for bravery in Iraq, came second in the grand final. Before winning last night, Ms Christie - who was competing as Miss London City - told event organisers: "My ambition in life is to compete and win gold in the 2012 Olympics. "I would also love to do well in Miss England, I want to be successful in whatever I choose to do in life." 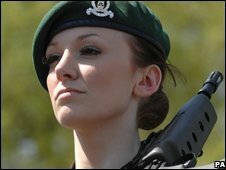 L/Cpl Hodge from Tunbridge Wells, has been in the Army for five years and was awarded a commendation from her unit, the 1st Battalion, Royal Anglian Regiment, for her actions during a posting in 2005 in Basra. She said ahead of the vote: "By no stretch do I think I am the most beautiful girl in England, but for me this is not what Miss England is about. "I think the winner should be beautiful on the inside as well." The pageant was interrupted by spectators who gathered outside the entrance of Metropole Hilton Hotel and denounced the competition as sexist. Do I still want world peace?